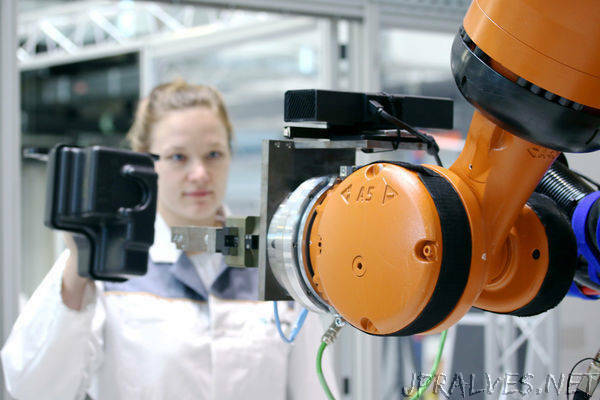 “Scientists at the Fraunhofer Institute for Machine Tools and Forming Technology IWU have developed an innovative technology enabling people and large industrial robots to work together in an intuitive way that feels a lot like human teamwork. Using the benefit of this technology, robots can recognize gestures, faces and postures to make this collaboration that much safer and more efficient. Fraunhofer IWU is set to present this innovation at the Hannover Messe Preview in hall 19 on January 24, 2019, and at the Hannover Messe in hall 17 at booth C24 from April 1 through 5, 2019. The Fraunhofer Institute for Machine Tools and Forming Technology IWU has come up with an unprecedented technology to make human-machine teamwork more efficient, benefiting the entire manufacturing workflow. “We have added effective, secure and flexible interaction to legacy technology. This is the first time humans can communicate and collaborate directly with heavy-duty robots based on hand gesture in the industry,” says Dr.-Ing. Mohamad Bdiwi, head of department for robotics at Fraunhofer IWU. This collaboration goes something like this on the shop floor: The machine recognizes human gestures, faces and postures when a person enters the robot’s work zone. This data serves to make the teamwork safe and to control the robot. The human simply gestures, using hands and arms to instruct the mechanized coworker to perform a task. The robot is able to interpret even complex movements. “Our technology brings gesture control to industrial applications. To date, it has been used mainly in gaming applications, for example, for consoles,” adds Bdiwi. The robot does not only track hands; it also scans faces. For example, if the human glances sideways or rearward to talk to another coworker, the machine knows to ignore gestures meant for others. Human and robot can work together directly and even pass parts and tools back and forth. The robot ‘sees’ when a hand is too close to the worker’s face, and waits for it to be extended out of the danger zone before handing the object over. This human-robot interaction comes courtesy of smart algorithms and 3D cameras that lend the robot the power of sight.